If you’re looking for a dirt cheap hand mixer that will do the job, you may be drawn to this one. While we don’t think it would be the worst purchase of a hand mixer you’ve ever made, we recommend you proceed with caution, and see if you have a little extra cash to upgrade. Why? One big reason you will read below could cause you to throw out your food after mixing it. This is as about as basic and cheap you can get on a hand mixer. Note that there is one cheaper we found that is made by Proctor Silex that comes in black. While we didn’t review that one, in this price range it is probably safe to assume it is similar in features, durability, and usefulness. If you are looking for a simple, basic hand mixer this one may meet your needs. However, some of the comments we found across thousands of hand mixer reviews were a little disturbing. While there is the occasional overloaded motor when doing heavy batches (common with many hand and stand mixers), we did not like that chrome and other material can easily come off the beaters into your food. To us that is a borderline safety issue. Between the beater coating coming off in your food, and numerous reports of motor overload we can’t recommend this mixer. We encourage you to spend a bit more and have a mixer that will last for years and not having you worry about the issues noted below. Like most hand mixer reviews you read [or possibly have even written], the mixing ability is really up to how well you control the mixer and move around your mixing bowl. Other than the mixer motor burnout issues mentioned in many reviews, most users found the mixing capability and power to be more than adequate for expected hand mixer jobs. You obviously wouldn’t buy a hand mixer with expectations of doing 4 loads of bread or heavy cookie dough, and 250 watts of mixing power is more than enough for a handheld mixer. Although a surprising numbers of reviewers rated the mixer 4 or 5 stars, when reading through comments many people had problems with the beater attachments being hard to get off at times. The motor burnout reports and beater coatings flaking off while mixing are further signs that you get what you pay for in this price range of hand mixers. This Hamilton Beach hand mixer model comes with a single set of chrome plated beaters. Some reviewers noted that it is difficult to find replacement beaters or other attachments for this model of mixer. If you don’t read any further than this being a Kitchenaid Hand Mixer, you’d be in good company. Long considered a gold standard for both hand and stand mixers, Kitchenaid is one of the few companies left still manufacturing mixers in the United States. Our findings were fairly consistent with the excellent reputation Kitchenaid has in the mixing product space – but this was not our top rated hand mixer. Find out why this isn’t our top reviewed hand mixer below – you may be surprised. After all – it is a Kitchenaid hand mixer right? Colors: Boysenberry, cranberry, crystal blue, empire red, green apple, hot sauce, lavender, majestic yellow, onyx black, pink, tangerine, watermelon, white. We were fully expecting the reviews of this Kitchenaid hand mixer to result in this being our favorite. Surprising, that wasn’t the case. Unlike some of the high end Kitchenaid stand mixers, it appears there were some missed expectations on the design of this hand mixer – specifically in the area of power. The key items we really liked included the wide range of colors (named using a scheme normally found on nail polishes, where red can’t simply be red), the stainless steel beaters and optional attachments, and how lightweight it was. However, after reading through actual user experiences, here is what we found. Sheer number of colors beats out any other hand mixer we considered reviewing. Stainless steel beaters, as well as a wide range of stainless steel attachments available for purchase (some models/colors actually include a fuller set). Most common complaint is too slow and too underpowered. This is what decided how to rate this hand mixer for us. The bottom line is there simply isn’t enough power to handle a lot of recipes, and even when it feels powerful enough the speeds are too slow to adequately combined the ingredients. The most overwhelming complaint across users is the lack of power, speeds are too slow, and as a consequence it has a rather poor mixing ability. So while Kitchenaid may be your go-to manufacturer for stand mixers, they missed the mark on their hand mixers. They are cute, and come in many colors, and lightweight – but if they don’t do the job does it really matter? We found very few reports of motor burnout, problems with attachments, or any other common theme around manufacturing defects. Overall this hand mixer is well made, but given the design goal of being smaller and lightweight, it may feel flimsy to people used to heavier duty hand mixers. So while it may be way too underpowered for most of your recipes, it is unlikely to fall apart. This Kitchenaid hand mixer being reviewed has a decent variety of attachments. However, only a couple of variants/colors of this model ship with anything more than either beaters or wire whisks. Which means you will be spending more money for the attachments you need. The mixer comes with two stainless steel “turbo” beater attachments. If you move up to a more expensive hand mixer in this line [e.g. the Kitchenaid KHM926OB] you will receive a pro whisk, dough hooks, beldning rod, and even a storage bag. We believe the additional mixer attachments can be purchased separately even for this model, but double check ahead of time to be safe. While not yet a household name, VonShef is beginning to encroach on Kitchaid’s mixing turf. Both their stand mixers and their hand mixers offer compelling features, a lower price point, and very pleasing designs. This mixer is hard to beat [no pun intended] relative to the included attachments, the power, and eye pleasing design. So how did the reviews of the VonShef hand mixer stack up? Let’s check it out. The VonShef mixer looks great. Very pleasing design, available in two basic colors, very powerful yet amazingly lightweight, and comes with 3 sets of attachments. So why were the ratings for this mixer skewed lower than our other two reviews above? Apparently there is a systemic design flaw in the beater attachment head, causing the eject button to be extremely hard to activate – or worse yet having it get stuck. Some other minor issues, however, added up to many users and reviews not being happy with this mixer. We did not find any significant evidence that the attachments had issues with rust or chrome flaking off, which is an improvement over some other hand mixers. Some users reported rust after putting beaters in the dishwasher, but these seemed more the exception than the rule. Power. Power. Power. Many people indicated they never had to get above the second speed. Amazing lightweight given a 250 watt motor. Ok – so this mixer has POWER. The single biggest complain across all negative reviews was it has too much power. Ingredients flying out of the bowl, chaos reining in the kitchen, people covered with flour. Maybe a little too melodramatic. In our opinion you may have to learn how to mix a bit differently especially when starting with only dry ingredients. In our opinion this would not be enough to rule out this mixer as a great buy. The various attachments all seemed to work well based on the numerous hand mixer reviews we poured through. So we would give this a thumbs up for power and mixing ability – even if it may be too much for some cooks to handle! Overall we struggled to find consistent reports of the mixer breaking, motor burnout, or major defects or breakdowns. The most common complaint among negative reviews was problems with the buttons. Both the eject button and the turbo button could be hard to press, and occasionally could get stuck. This seems like a slight design flaw given how consistently it was reported versus an occasional manufacturing defect. So overall reliability takes a hit due to these button issues, but not really due to flaky construction or a weak motor. 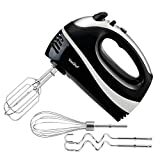 This VonShef hand mixer comes with 3 attachments: beaters, 2 dough hooks, and a balloon whisk. As far as we could find the mixer attachments are chrome plated versus stainless steel, but we didn’t read any mixer reviews indicating issues with the chrome flaking off. There were some scattered reports of rust on the beaters after a couple of trips through the dishwasher, but again if you hand wash these you may never see this problem. Cuisinart has to be one of the more recognized names in kitchen appliances, making a wide range of mid to high end blenders, food processors, and yes mixers. Although this mixer is one of the more expensive hand mixers we reviewed, it is also the one we liked the best. With clean lines, a modern design, and a solid attachable bottom case of attachments it matches many features of the VonChef, but without some of the drawbacks and design issues reported in many reviews. This is our favorite mixer out of the group we studied. While not the cheapest, it is the second most powerful in terms of watts, it has the highest number of speeds which helps manage the amazing amount of power available, and it is build solid. While you may spend a bit more initially, we think this mixer will meet all of your needs and be around for quite a while. It also offers a 3 year warranty, whereas virtually every other hand mixer only offers 1 year. This Cuisinart Hand Mixer has plenty of power to handle any job thrown at it. We found no significant reviews around problems with power, ability to mix any recipe, and effectiveness of mixing ability. We found a lower than average number of reports of systemic problems with this mixer. There were a few dead on arrival or after 2-3 uses reports. Negligible reports of any motor problems, and generally no trend in any design flaws or issues after repeated use. There are some occasional mixer reviews that mention problems with attachments staying in, but we couldn’t find any evidence that this was widespread. The Cuisinart hand mixer being reviewed here comes with 3 attachments: beaters, chef’s whisk, and dough hooks. They also throw in a spatula, but not sure that would by itself swing a buyer one way or another! The product descriptions found for this mixer did not explicitly call out stainless steel attachments, and a few reports of discoloration and rust after running through a dishwasher leads us to believe they are plated chrome. We found no significant reports of the beaters breaking or the coating ever coming off. If you are unsure whether any of these hand mixers will meet your needs, we encourage you to compare KitchenAid mixers to see if a popular stand mixer will meet your need. The variety of KitchenAid mixer colors will amaze you, and with models to fit almost any cooking and baking need this may work better for you than a hand mixer. Or do like we do and have both!